AAUW Morgan Hill celebrated its 35th anniversary in December, 2016. 41 women started our branch on December 7, 1981. Eight of those charter members have maintained their membership for 35 years and all attended the 35th anniversary festivities. Read their stories of why they joined AAUW Morgan Hill so long ago and what keeps them engaged today. 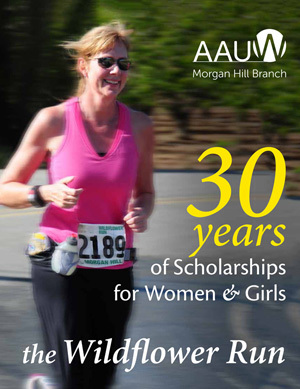 An important piece of the history of AAUW Morgan Hill is the history of our single, successful fundraiser, the annual Wildflower Run. Wildflower Run registrations, individual donations, and corporate sponsorships enable us, through our Wildflower Fund, to annually sponsor $50,000 in philanthropic activity locally and in support of AAUW’s national programs and priorities. Read a history of the Wildflower Run, created on the 30th anniversary of the event. To learn more about the specific recipients of funds raised each year, click here. For additional information, such as corporate sponsors or race registration and event details, go to our Wildflower Run website.